khatta dhokla or white dhokla is a fermented and steamed sour cake made from rice, black gram & sour yogurt. it is light and spongy. white dhokla is mildly spiced with ginger and green chilies. white dhokla recipe with step by step photos. khatta dhokla or white dhokla is one of the gujarati snacks that i love to make as well eat :-). any dhokla be it khaman dhokla or rava dhokla or dal dhokla are favorite snacks at home. 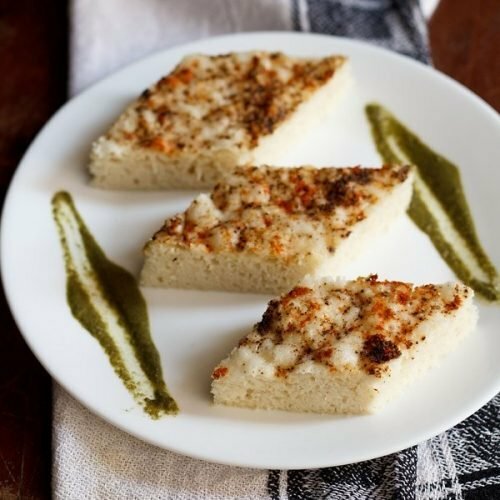 this recipe of white dhokla is a fermented version. 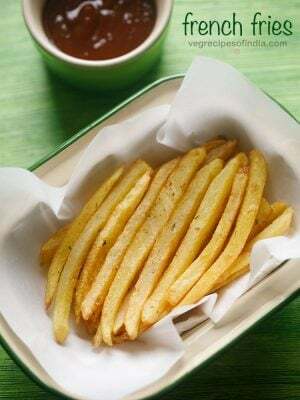 it is light, healthy and easy to make snack dish. ‘khatta‘ means sour and these dhoklas do have a light sour taste. the sourness comes from the addition of sour yogurt. for a pronounced sourness you could even add some lemon juice. 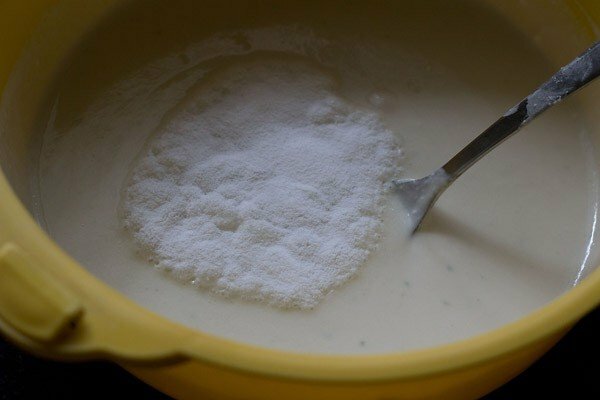 however, if the curd is very sour, then no need to any lemon juice. white dhokla taste awesome with some sweet chutney or papaya sambharo. i had served these white dhokla with curry leaves chutney. a proper english translation of khatta dhokla is – fermented, steamed, savory rice and lentil cakes which are light, spongy, porous and a bit sour. so they are a good gluten free snack and nutritious too. 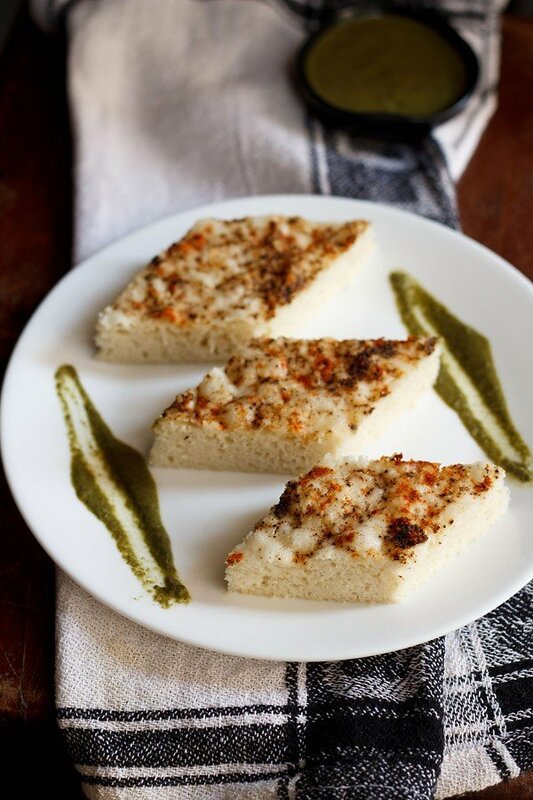 there is a hint of the taste & flavors of green chili and ginger in the dhokla. so they are lightly spiced too. they do come close to our favorite south indian breakfast snack idli. however they are sour, more spongy and spiced unlike the humble idlis. when living in mumbai, i would often buy these from the gujarati snacks or sweet shops. generally ready made khatta dhokla flour is used to make the dhokla. you can even grind rice and urad dal in your nearby mill. for 1 kg of rice, use 250 gms of urad dal, if you plan to make the dhokla flour. 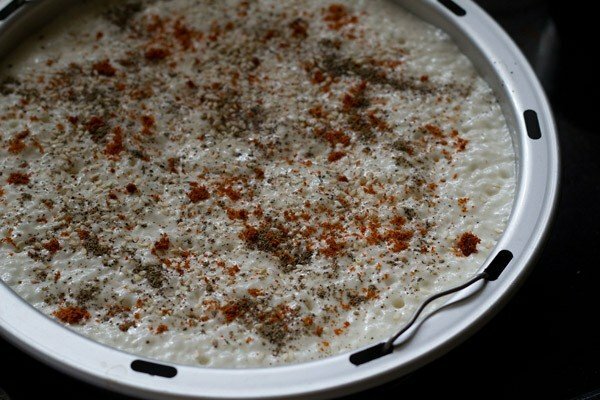 in this recipe, i have used basmati rice with urad dal. 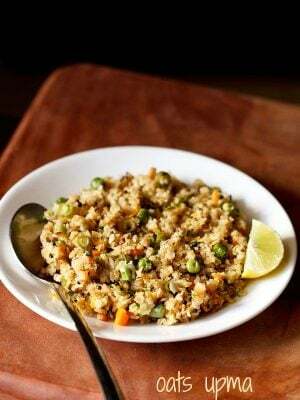 you can use any regular rice or even idli rava. rinse the rice and urad dal a couple of times in water. soak them together or separately in enough water for 3-4 hours. drain them well and then in a wet grinder, add the drained rice and urad dal. add chopped ginger and green chili also. grind the rice and urad dal adding 2 to 3 tbsp water at intervals. 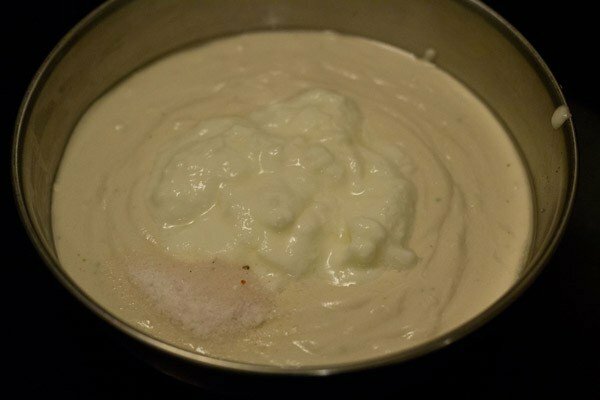 the batter should be thick like the idli batter. 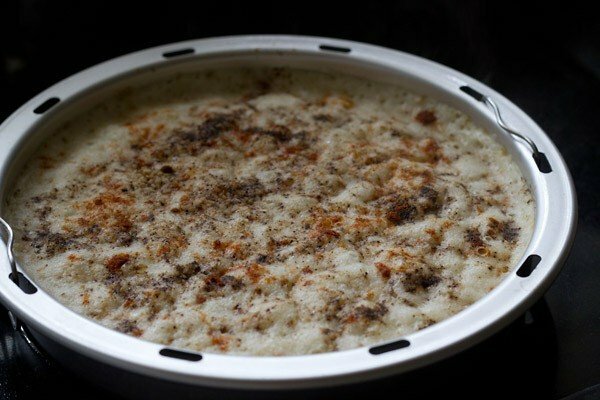 when you feel the batter, a little grainy texture of the ground rice is preferable. pour the batter in a deep bowl or pan. add the sour yogurt and salt. 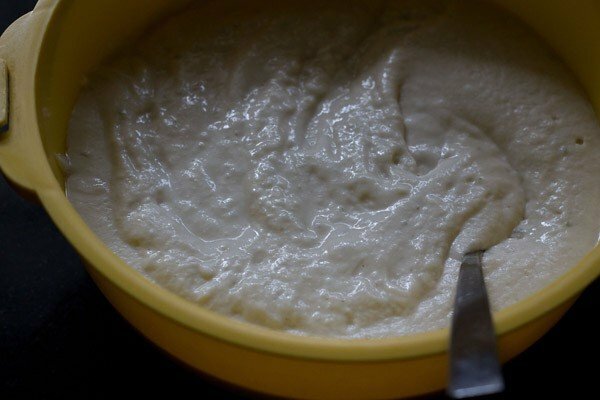 stir well and keep the batter in a warm place to ferment overnight or for 7-8 hours. before preparing the dhoklas, grease the pan in which you will be making the dhokla with oil. add water in your steamer or pan or pressure cooker and let the water come to a boil. first add oil in the batter and stir well. then add the fruit salt or baking soda to the batter. be quick enough to stir well, so that the fruit salt or baking soda is distributed uniformly in the batter. pour on a greased pan. sprinkle with black pepper powder, red chili powder and roasted sesame seeds. place the pan with the dhokla batter in the steamer or pot or pressure cooker. cover and steam for 20-25 minutes or more till a tooth pick inserted in the white dhokla comes out clean. if using a pressure cooker, remove the vent weight (whistle) and cover the lid tightly and steam for the same amount of time. when done, remove and let the white dhoklas become warm. 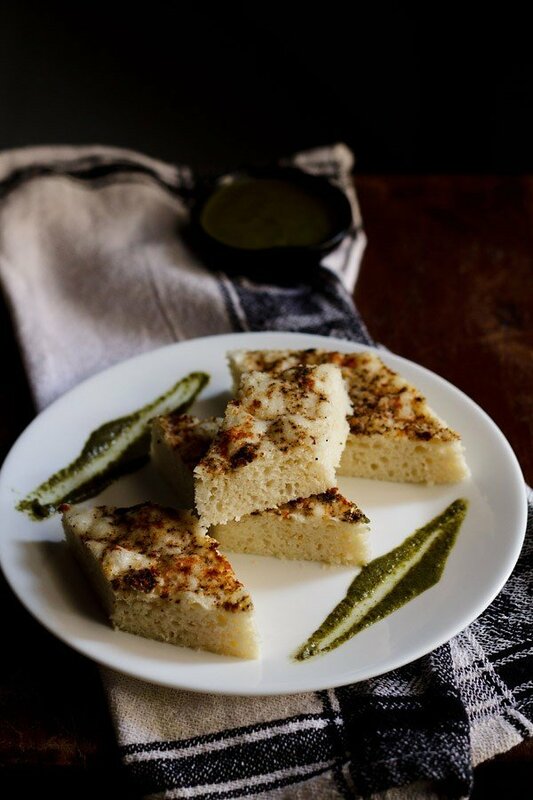 slice and serve the white dhokla or white dhokla with coriander chutney. about 1/2 to 1 tsp lemon juice can also be added if the yogurt is less sour. 1: first soak 1 cup regular rice (or idli rava ) and ¼ cup urad dal for 3-4 hours. drain the water and then grind the rice, urad dal, ½ inch chopped ginger and 1 chopped green chili with 2 to 3 tbsp water. the batter should be thick. you should be able to feel the grainy texture of rice in the batter. when grinding, the urad dal will grind till smooth & pasty but the rice grains takes some more time. a slight grainy texture of the rice in the batter is preferable. you can also grind them separately if you want. 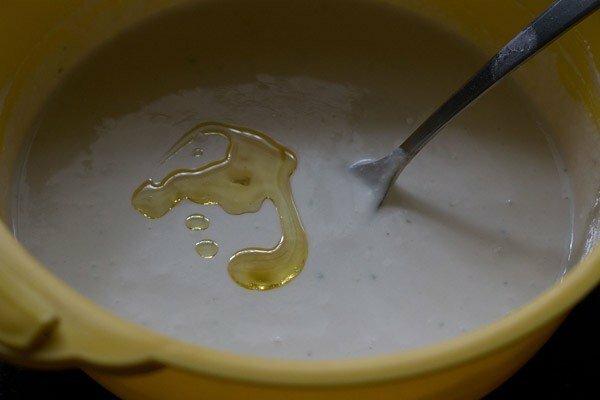 2: add ½ cup sour yogurt/curd and salt as required. 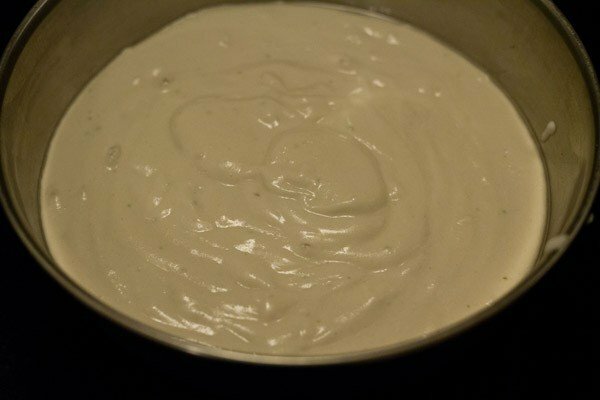 3: mix well and keep the batter to ferment overnight or for 7-8 hours. 4: the fermented dhokla batter pic below. 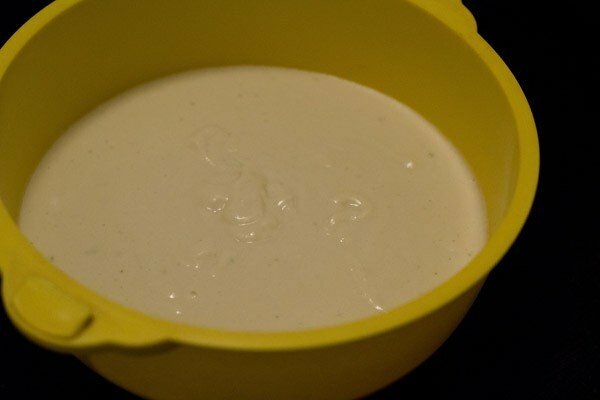 5: add ½ tsp oil to the batter and stir. addition of oil helps in the softness of the dhokla. 6: add 1 tsp eno or fruit salt to the dhokla batter. you can also add ½ tsp baking soda in place of eno. be quick enough to stir and mix the fruit salt evenly in the batter. 8: pour the white dhokla batter in a greased steamer pan and sprinkle with black pepper powder, red chili powder and roasted sesame seeds. the amount of black pepper powder, red chilli powder and roasted sesame seeds is as per your taste. 9: steam the white dhokla in a steamer or a pan for 20-25 minutes or till a tooth pick inserted in the khatta dhokla comes out clean. 10: white dhokla need not be tempered. you can serve them straight. slice khatta dhokla into squares or diamonds. you can serve khatta dhokla either warm or at room temperature with coriander chutney or with any sweet chutney. Welcome Kirti. Thanks for giving 5 star rating to dhokla recipe. Hi..everytime i leep the dhokla batyer fpr fermantation,nothing happens to it..it remains the same even after 7 to 8 hours ..i mean it should rise a little..but nothing happens to it..what can be the reason for it..can you please help..
for proper fermentation a warm room temperature is required. so in a cold climate fermentation takes a lot of time. so you can keep the batter for some more hours till you see the batter risen a bit. do we newd to cover the bowl too separately when steaming it in pressure cooker? no need to cover with a bowl. Tried the khatta dhokla, loved the taste.. and the recipe was very simple. Thanks for sharing the recipe. can we use urad dal flour and idli rava instead of grinding the urad dal and rice? 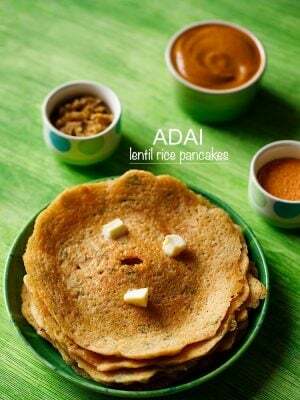 you can use urad dal flour and idli rava. use the same proportion as mentioned in the recipe which is 1 cup of idli rava and 1/4th cup of urad dal flour. anju, i will try to add some more eggless cake recipes. 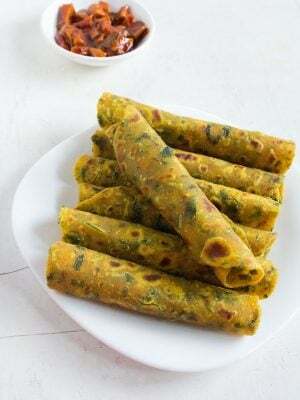 Hi dassana ji.. Ur receipes r very simple to make n delicious to eat.. N pics helps a lot.. It makes Cooking easier.. Thanks a lot..
welcome sneha. thanks for sharing your positive feedback. thanks aastha. glad to read your positive feedback on recipes. Hi, I tried this recipe for the second time. The dhokla always comes out to be very dry and not very soft. Is that how its is supposed to be? its soft. its soft like idli. i think the water being added is less. try adding some more water to the batter. Hi …can we make these in microwave? yes you can. just microwave for 2 to 3 minutes. welcome gowthami. glad to know this. can u give me some clarity on your ingrediant no.2. They say urad dal AND black gram. is it and or OR?? 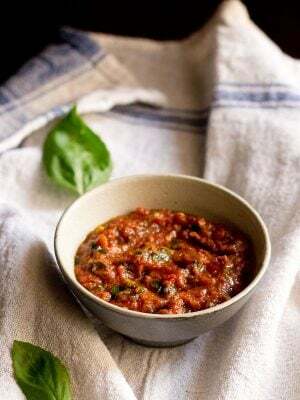 urad dal and black gram is one and the same. thanks ranvir for appreciating the recipes. hi priya. you will have to soak the idli rava for atleast 2 hours. Dassana You are the only person who can make simple food look so tempting and drool worthy. Its awesome. I have loaded qubooli recipe inmy site referring ur site.Thank you so much. i love teh pics.. they really make me drool here.. they are so well made dassana.. love it..
thanks renu for all your comments. you have been very generous and made my day too.